Nestled between the Highlands and the Border Hills lies Scotland's elegant capital, Edinburgh a gracious city noted for its rich history. Explore the cobbled alleys of the Old Town and gaze at the spectacular collections and timeless architecture at Edinburgh castle. Try some traditional haggis, neeps and tatties also don't forget to sample some Scotch Whisky, the national drink. Edinburgh Castle dominates the cityscape of Scotland's capital from its rocky perch. Learn about this elegant castle from its early times up to present day and you will understand why over a million visitors annually visit the castle. Discover what life was like on board the Royal Family's former seagoing palace, explore the fine art and ancient artefacts of this famous ship. Princes Street is a thriving shopping street and place to find many large brand name stores. You can escape the busy streets and relax in the beautiful gardens, or enjoy the many sidewalk cafes. 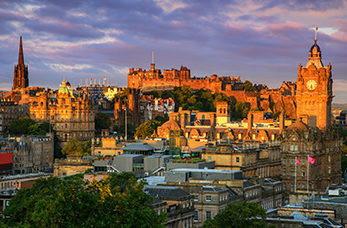 The world famous Royal Mile runs through the heart of Edinburgh's Old Town from Edinburgh Castle and Holyrood Palace. Today it's an eclectic mix of shops, pubs and restaurants and historical sites including St Giles' Cathedral.